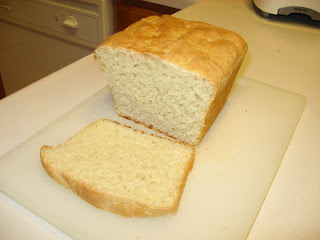 While I was home a few days ago, I stole one of my mom's loafs of homemade english muffin bread. Well, actually she gave it to me. I don't think I've ever met someone who doesn't like an english muffin. Whether it be to have as your "toast" in the morning, used as a sandwich, or as the crust for a mini pizza, in my opinion it is all good. The nooks and crannies in the muffin, make it all that much better....letting whatever you put on it, sink into those holes. This recipe makes two loaves of english muffin bread. The loaves can easily be frozen and saved for later. This bread is SO GOOD. It's like having your english muffin, but just in bread form. The trick to getting it really good is toasting it dark or even twice. For some reason this bread only tastes better when it has that "crunch". Heat liquids and add to dry ingredients - mix well. Put into two greased loaf pans. Let rise in a warm place for 30-45 minutes. Bake at 400 degrees for 20-25 minutes or until golden brown. See how simple that is? 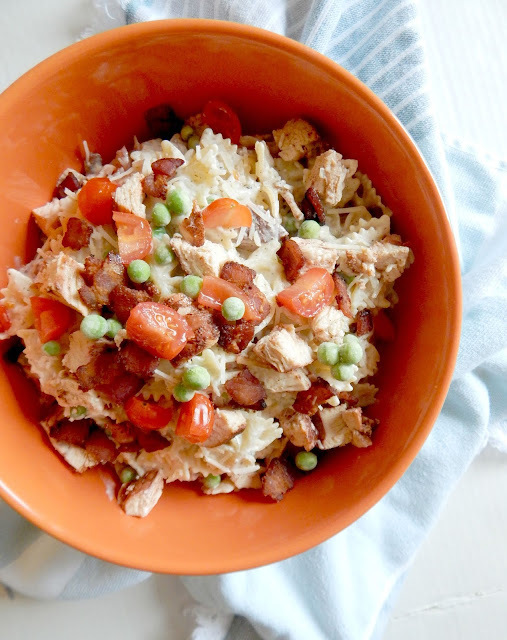 You cannot fail at this recipe. Another great one for bake sales or to give as a gift! Little man and I are taking our walking adventures on the road today. It's only a high of 52, so I really don't feel like bundling him up. Instead we are doing a Target (or Tar-Jay, if you will) run with another mom and her little guy. Then probably walk the mall like the old folks! Looks yummy! Ally - I meant to tell you I made the recipe for the gluten free peanut butter cookies for a friend! They loved them - thanks for all the recipes you post! Yeast and I are not friends. I avoid it all costs, and it avoids me by hiding at the back of my cupboard at all times. We've been together on 2 occasions, both with disasterous results! I do love English Muffins, and the bread looks fab! YUM this looks so easy and delicious! I LOVE english muffins, so bread form would ROCK! 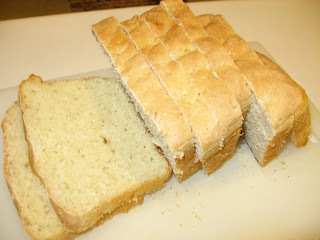 English muffin bread sounds delish! It may make for an interesting twist on eggs benedict :). Wow how easy is that?! And certainly a LOT cheaper than English muffins - those are expensive! This looks great! And, I love the fact that it is so simple to make! Hopefully you found some good stuff at the mall...gotta love a good Target run! I always manage to find something that I have to have when I am there! I've never heard of English muffin bread. I want to make this but have a question. Do you disolve the yeast in the liquids? If so, is it done before or after they have been warmed? Yeast and I are long time enemies, but I'd like to try to make amends with this recipe so thanks!! that bread looks fantastic. my grandma always has english muffin bread at her house & i LOVE it! Looks amazing! I've never heard of English muffin loaf, but I'm loving the idea of this!! I've never tried English muffin bread. It looks delightful! oh that bread looks so good! I figured out the calories. If you cut each loaf into 10 slices, each slice is 147 calories, .4 fat and 1.2 fiber! Not bad! And, of course if you cut it into smaller slices, it would be even less! I so wish I could eat white bread. Love english muffins, but have switched over the whole wheat. I supposed this recipe could be made with whole wheat flour?? Thanks for stopping by Pickley Pear - so nice to find new readers and blogs!!! Great blog! I just book marked this recipe- sounds super yummy. You're right, who doesn't like English Muffins?? This is the only way I make English muffins. This batter bread IS very very good! !